Home » Training Videos » Who are They Anyway? Home → Shop → Training Videos → Who are They Anyway? Grumbling and complaining provide the soundtrack for the daily drama that gets enacted in businesses large and small. And everyone thinks it’s some else’s job to do something! One set of 27 "Memory-Cards"
Additional books and “Memory-Cards” may be purchased for each participant. Things fall between the cracks; orders don’t get processed; deliveries are late; paperwork slows to a crawl; quality suffers; complaints increase but never get addressed; the buck gets passed endlessly from department to department; and the ultimate losers are the organization’s customers. Do any of those things ever happen in your organization? Hopefully it is not too late to find out just who are “they” anyway? For when we find the answer to that question, we’ll find the answer to our problems. This entertaining and enlightening video, Who Are ‘They’ Anyway? 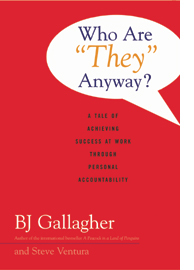 and the accompanying Facilitator’s Guide are designed to help you and your organization make the shift from looking for “them” to blame to realizing that there IS no “them” and beginning to accept personal accountability. The training designs, participant handouts, group’s discussion questions, and individual exercises are all aimed at providing a powerful catalyst to help everyone in the organization understand that personal responsibility is a choice. Each day, each hour, each moment, you make a choice about whether you are going to be responsible for your job and your life, or whether you are going to abdicate responsibility and look for “them” to blame instead. No one makes that choice for you – you do it yourself. Consciously or unconsciously, you are the one who does the choosing. No one can make you be responsible – only you can choose it.